For Tate’s Van Gogh and Britain exhibition, opening on 27 March, the National Gallery is lending its Sunflowers—which will be displayed in a fresh context, to show its impact on British art. Until now it has not been appreciated quite what an inspiration this single painting has been to generations of artists. 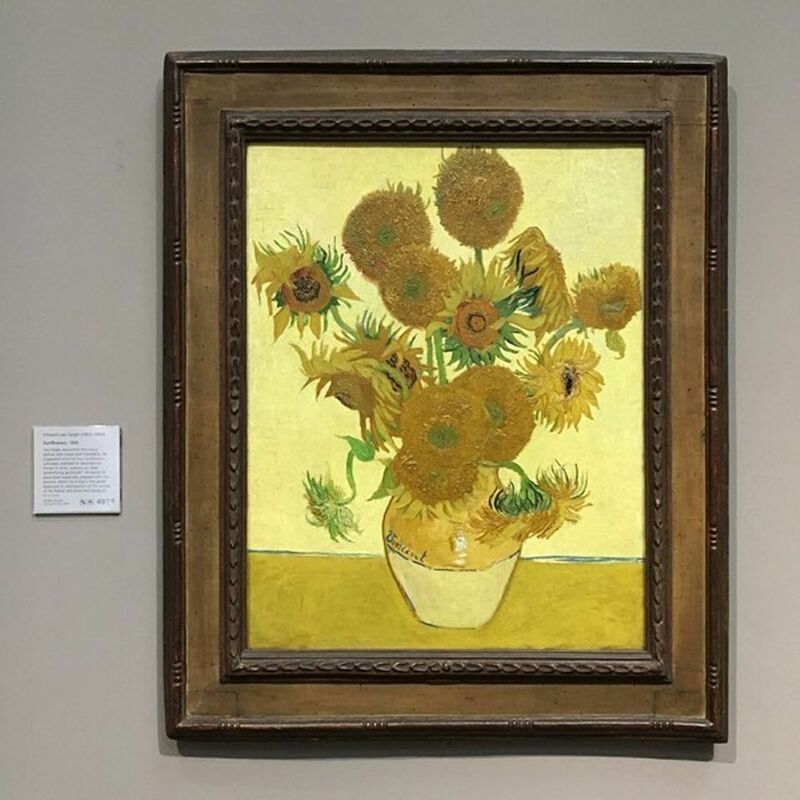 Thanks to the Art UK website, which records nearly all oil paintings in public collections, one can track the extent of the influence of the Sunflowers. A search for “sunflowers” on this comprehensive site brings up 80 pictures. Some artists, of course, painted them because they are dramatic and symbolic flowers. But it is probably fair to say that over half the pictures were partly inspired by the Dutch master. 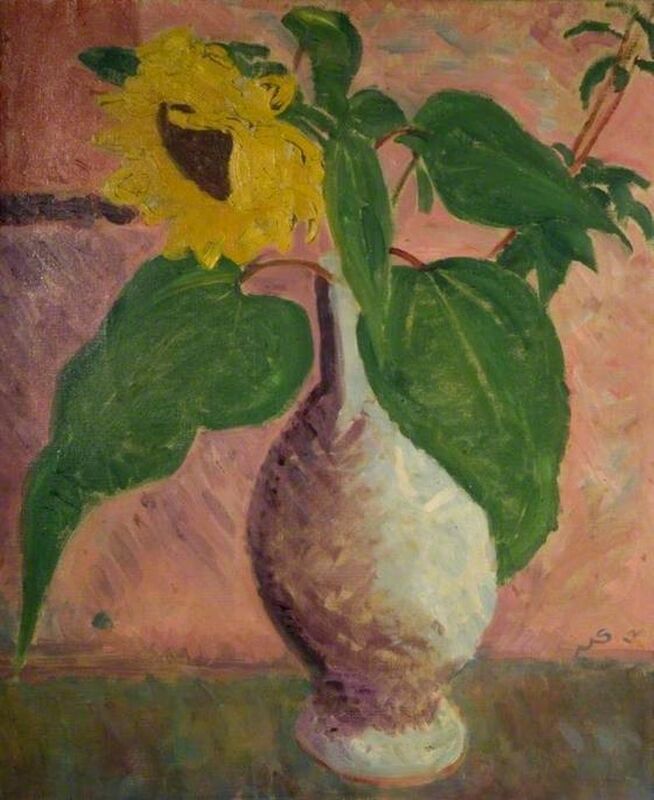 At least one of the versions of Van Gogh’s Sunflowers with a yellow background was shown in the UK in the 1910-11 Post Impressionist exhibition. Since 1924, when the finest version was acquired for the national collection, it has been on display in London, where it must have been seen by every leading British artist. Initially it was at the Tate and, since 1961, at the National Gallery. 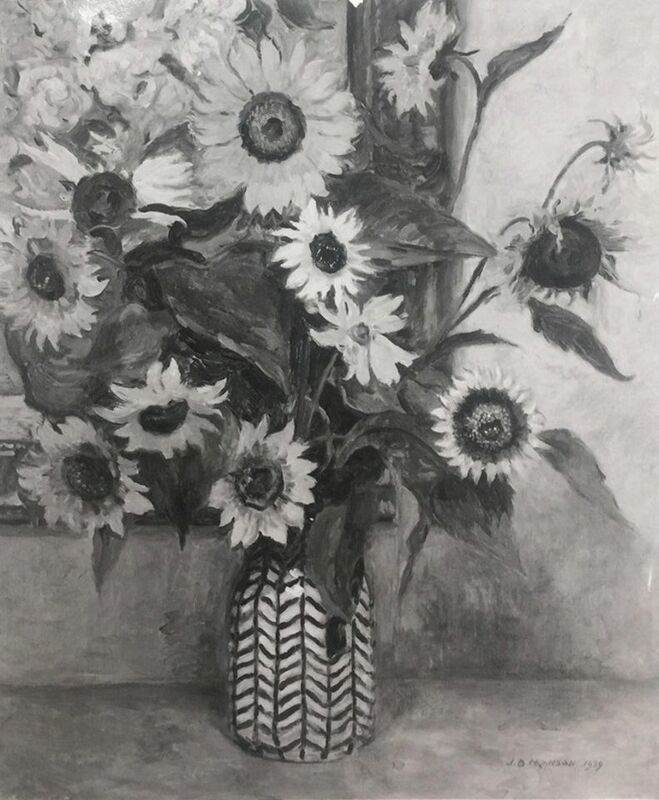 The London Sunflowers (1888) has also long been known from countless reproductions—from 1911, as the frontispiece of Charles Lewis Hind’s pioneering study of the Post-Impressionists, and, in colour, from 1928, in a book called Flower & Still Life Painting. For decades, the painting has been the National Gallery’s best-selling postcard. Frank Brangwyn was one of the earliest British admirers of Van Gogh. In his Sunflowers the yellow blooms appear to be clustered in the open air, set against a bold blue sky. The central flower almost seems to explode out of the picture. Brangwyn’s contrasting complementary colours, so beloved by Van Gogh, are reminiscent of the Dutchman’s painting of The Yellow House (1888, Van Gogh Museum, Amsterdam), which shows his home viewed under a sky of the deepest blue. 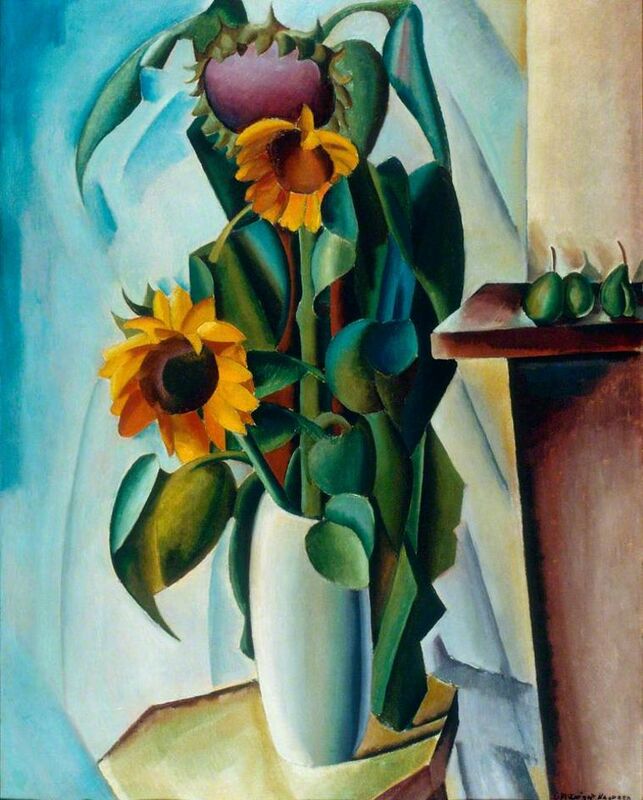 Edward McKnight Kauffer’s Sunflowers dates from 1917, after the American-born artist had moved to London. In a somewhat Vorticist arrangement, three blooms stand in a tall pot. Just before the start of the First World War Kauffer had taken the Dutchman’s published letters on a painting trip to France and a friend recalled that “Van Gogh was his hero-figure”. 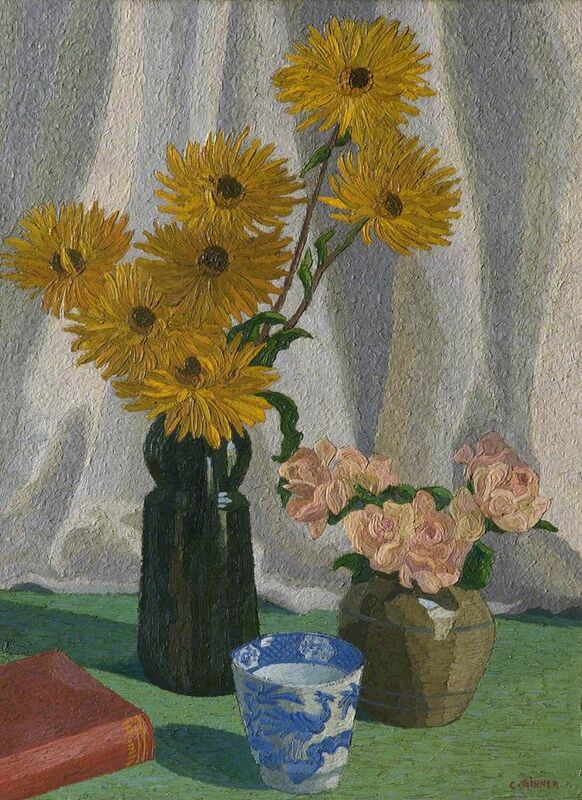 Charles Ginner, another Van Gogh fan, had been born in Cannes to British parents and probably saw the 1910-11 Post Impressionist show in London. His still life composition includes seven sunflowers in a pot, a few pink flowers, a book and a small oriental bowl. Although Ginner’s dwarf sunflowers are of modest size compared with Van Gogh’s exuberant blooms, the inspiration must have come from the Dutch artist. Margaret Davies is known primarily as an early collector of Impressionism and Post-Impressionism, who along with her sister Gwendoline gave their paintings to the National Museum Cardiff. These included Van Gogh’s Rain-Auvers (1890), which Gwendoline had bought in 1920. 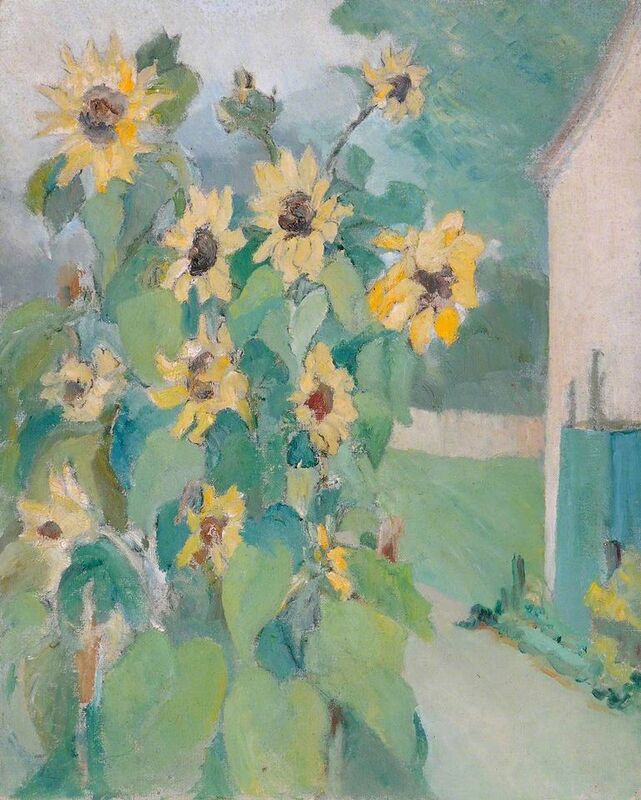 Margaret was also an amateur artist and she depicted her sunflowers outdoors, presumably partly in homage to the Van Gogh landscape of Auvers that hung in the sisters’ music room. 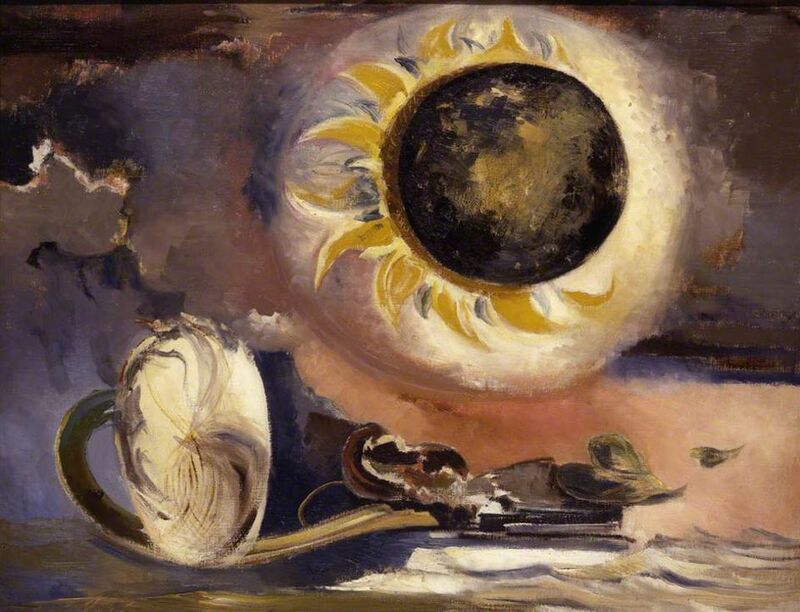 James Manson painted his bowl of Sunflowers in 1939, the year after he stepped down as director of the Tate. This little-known picture is not on the Art UK website since it is privately owned, having been sold at Sotheby’s in 1979. 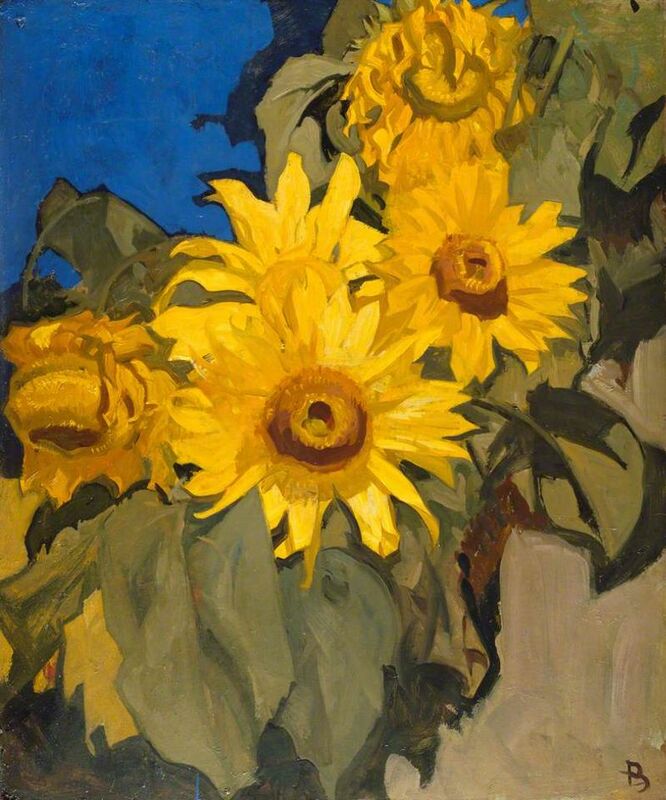 Manson knew the Tate’s Sunflowers intimately, after working at the gallery for 25 years—so it was his inspiration. Manson was a great admirer of Van Gogh, once saying that he holds “a high place among the great artists of the world”. But although the Frank Stoop bequest of an important late Van Gogh painting of cottages and three works on paper came to the Tate in 1933, Manson was unable to buy any Van Goghs for the gallery during his eight-year directorship. At that time £5,000 would have bought some of his finest paintings. Indeed at Tate’s last Van Gogh show, in 1947, its Sunflowers, probably the artist’s most valuable work, was valued at £7,500. Martin Bailey is a leading Van Gogh specialist and investigative reporter for The Art Newspaper. Bailey has curated Van Gogh exhibitions at the Barbican Art Gallery and Compton Verney/National Gallery of Scotland; he is now co-curating Tate Britain’s The EY Exhibition: Van Gogh and Britain (27 March-11 August). He has written a number of other bestselling books, including Starry Night: Van Gogh at the Asylum, published by White Lion (available through Amazon in the UK and US), The Sunflowers are Mine: The Story of Van Gogh's Masterpiece (Frances Lincoln 2013, available in the UK and US) and Studio of the South: Van Gogh in Provence (Frances Lincoln 2016, available in the UK and US).